Peters’ Facebook from November 6th post in which she claimed to have been “groped in Tallahassee” is displayed immediately below. Peters’ refusal to name her assailant is noteworthy given an earlier statement she made that if an accusation of sexual harassment “is anonymous, it is not legitimate.” Yet Peters provides this very anonymity for her alleged assailant(s). 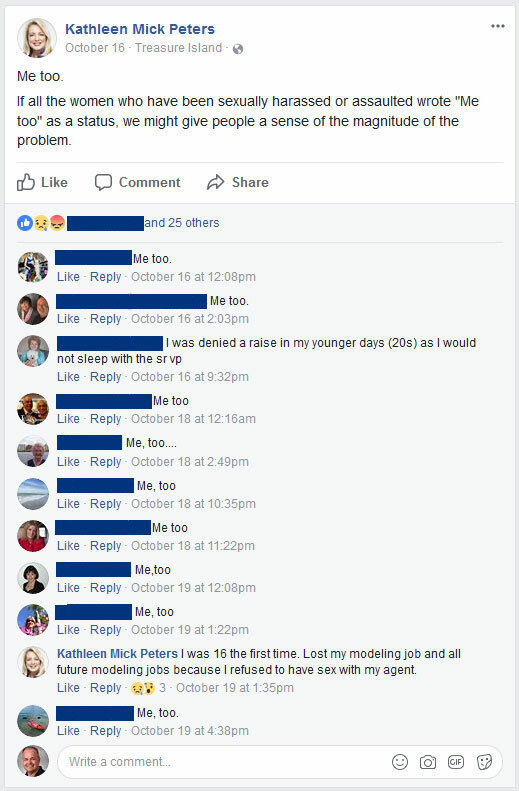 “Anyone can make up stories if that person is protected with privacy,” Peters said in the now deleted November 4th Facebook post shown below. In it, she referenced sexual harassment accusations against state senator Jack Latvala that had been reported a day earlier by Politico Florida. Peters’ decision to provide anonymity for her alleged sexual harasser(s), while at the same time calling for accusers to give up their anonymity, may further her accelerating political demise. More on that demise later. Peters’s November 4th Facebook post, which she stands by, yet which she removed. The second half of 2017 has been rough for Peters. In August, the Tampa Bay Times reported that Peters had been “ousted to political Siberia” in the State Legislature in Tallahassee. The Times gave the “Siberian situation” as the reason for her decision to not seek re-election and instead run for the Pinellas County Commission district 6 seat in 2018. The next day, Peters repeated those exact words in the Facebook post seen on the right, but without attributing them to Milano. It was also in this post that Peters first stated that she had been a victim of sexual harassment, referencing an incident four decades ago. In her post, Peters made no mention of any harassment against her in Tallahassee. Six months later, Peters was calling on such alleged victims to step forward. Any harm to the victims was apparently less important than defending her political tag team partner and mentor Jack Latvala. 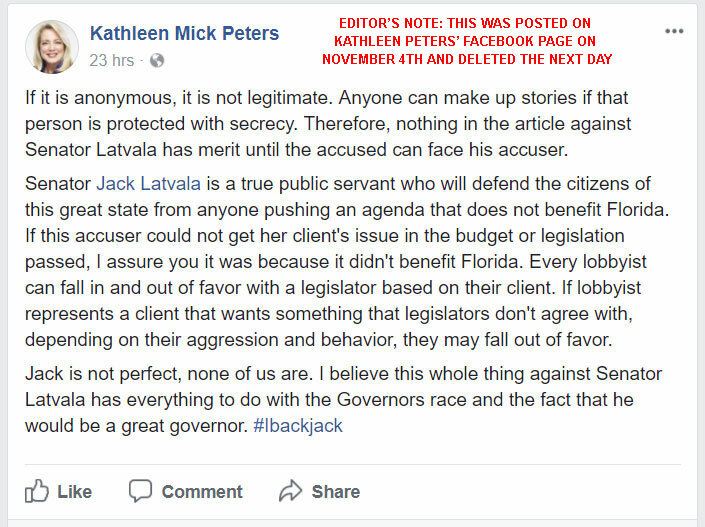 Latvala was himself excoriated last week by fellow Republican state senator Travis Hutson (R-St. Augustine) for leaking the identity of his accusers. 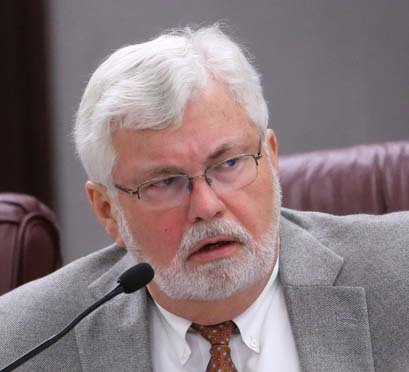 “This highly respected and regarded establishment is being burnt to the ground and I feel Sen. Latvala is running around with the napalm and the matches,” said Hutson. House speaker Richard Corcoran and three senators out of 38 have called on Latvala to resign. 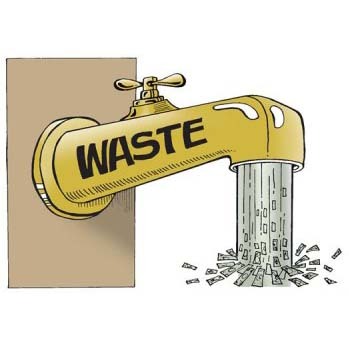 “There’s some concern that any bill that has my name on it won’t be moving at all,” Peters said at yesterday’s Pinellas Legislative Delegation meeting. Peters was asking rep. Chris Sprowls and rep. James Grant to help her move a particular bill forward. Neither offered a verbal response. Peters’ unusually frank acknowledgment that she has no political influence will surely be seized upon by her Republican opponents in the Pinellas County commission district 6 race. Those opponents are Larry Ahern, and Barb Haselden, founder of No Tax For Tracks. Both declined to comment for this article. Peters’ claim that “anyone can make up stories” has a flipside: anyone can falsely claim to be a sympathy-worthy assault victim by simply refusing to name their assailant. Does Peters, as an elected official, have an obligation to name the assailant/groper?